The IDEO offers students and researchers a home in a particularly favorable environment for research, the Scholars’ House. It bears the name of Father Gilles Couvreur, in recognition for his generosity for the IDEO. 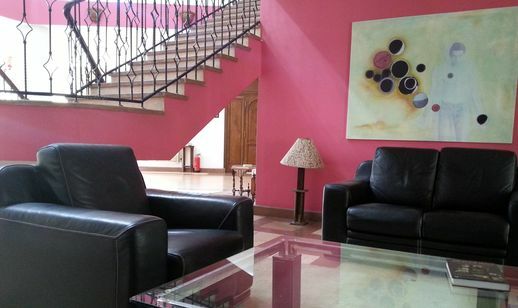 Built in the peaceful garden of the convent of the Dominicans, directly connected to the library, the Scholars’ House is a comfortable and quiet place to stay in Cairo, next to al-Azhar and Islamic Cairo. Guests of the House have privileged access to the Library. They participate in a regular seminar, with the IDEO research team. They are invited to submit articles to MIDEO. The Scholars’ House offers, in a new building, 5 rooms (one of them is a double room) air-conditioned and soundproofed, with private bathroom. WiFi is available throughout the house. Lounge, kitchen, washing machine and satellite television are common. Guests of the House will have access all the time to the garden of the convent and to the Library. This rate can be adapted to singular situations, do not hesitate to talk to us. It includes housing and services; meals are the responsibility of the guests. To ask to stay in the Scholars’ House or more information, please send us an email: gro.o1556173510riac-1556173510oedi@1556173510sralo1556173510hcs1556173510.